The artist behind the controversial B of the Bang sculpture in Manchester is appealing for it not to be destroyed. Councillors voted to put the artwork in storage over safety concerns, but said it could be rebuilt in the future. 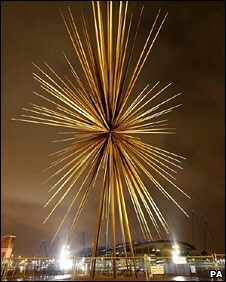 One of the £1.4m sculpture's 180 steel spikes was dislodged within two weeks, and 22 were eventually removed. But although artist Thomas Heatherwick had to pay the authority £1.7m in a legal row he said he was committed to its place in the city. Manchester City Council voted on Wednesday to mothball the sculpture until the necessary funding - estimated between £2m and £3m - can be found to revive it. Speaking to BBC Radio Four, Mr Heatherwick said he was personally distressed when the technical problems first emerged in 2005. "But separating myself from it, it's the most major public art commission that I know of being done in this country. "So there's a really symbolic importance to taking that and solving it for the cultural landscape in which we live. It's really important that commitment is carried through. "If something like that was to be not brought back into existence... that would allow people to indulge fears in the commission of major works." Mr Heatherwick said the council's stance on public money going into the rebuilt sculpture was "understandable" but said they remained determined not to give up on it. "I've been in discussions with Sir Howard Bernstein (chief executive) really looking at this and I know they are personally very committed to this," he added. The artist ruled out moving the sculpture to another city and appealed for private funding - or a "fairy godmother" - to help resurrect his creation. "I love the city and I'm not interested in building it anywhere else. The city was committed to doing it, I was committed to doing it for the city. I'm pretty determined that it stays there." The artwork was commissioned by the council to mark Manchester's Commonwealth Games in 2002 and stands outside the City of Manchester stadium.